The Relevance of Edison’s Ear? Readers, you may be interested in a new website that features Canadian documentary films, many of which were screened at one time or another at the wonderful Hotdocs Documentary film festival that takes place annually in Toronto. There are a few films that may be particularly relevant to scholars of the nineteenth century including Seeking Salvation, which is a history of Black churches in Canada including their role in the underground railroad, and The Jolifou Inn, a short film from 1955 about the art of Cornelius Krieghoff. I was particularly excited to see Francisca Duran’s interesting film Mr. Edison’s Ear, which I missed at the 2008 Hotdocs festival, included in the on-line documentary library.The short experimental film addresses Edison’s phonograph and features a range of wonderful, and sometimes strange, early sound and motion picture recordings. (A warning though, that the film closes with the infamous footage of the electrocution of Topsy the elephant at Coney Island, which is difficult to watch). Another bonus is that the film features interviews with the incomparable Lisa Gitelman, whose book on nineteenth-century sound technology, Scripts, Grooves, and Writing Machines, I very highly recommend. The film focuses on the fact that Edison, a key inventor of early sound technologies, was deaf. However, I’m still uncertain about exactly what Duran is suggesting about the relationship between Edison’s deafness and his inventions. In one interesting part of the film, Duran juxtaposes a visual scene of someone coming up to Edison and shouting into his ear with audio of a scratchy, static-filled, attempt to play back a damaged wax cylinder. She seemingly aligns Edison’s struggle to hear the sound texts he was recording with our own struggles, over a century later, to do the same. But, surely, there is an important distinction between sensory difference and technological durability. In my own research into the relationship between the history of sound technology and deafness, I struggle with this same question. So many of the important nineteenth-century innovators in sound technology were attempting to devise ways to technologically augment human hearing, often with deaf people specifically in mind. 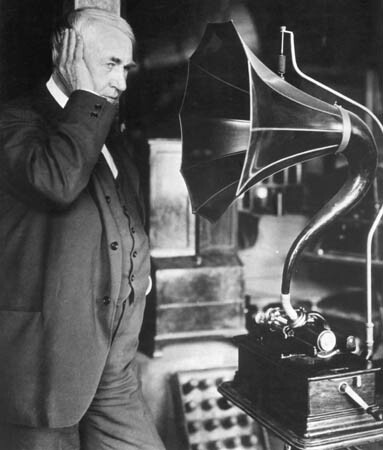 But I am always left pondering the relevance of Edison’s deafness, for example, to his inventions and to how we understand the cultural history of sound. Many scholars of sound history have highlighted the curious irony of this connection between Edison’s deafness and his invention of sound technology but what, beyond the merely biographical, can we gain from this line of inquiry? Thanks for mentioning this, Jen! What a great resource.